I am here in Indiana, Pennsylvania, shortly before the much-touted eclipse of the sun will begin to be seen on the west coast. Although the event certainly interests me, I didn’t seriously consider traveling to the path of totality. Seeing the full eclipse would involve both travel and luck. One could be at the center of the eclipse path and still see very little if the sky is overcast. In a few years, a total eclipse will be visible much closer to home, and the odds of not wasting a good deal of effort will be better. A few days ago, today was predicted to be sunny in Indiana. Alas, the reality is that it is a relatively cloudy day, punctuated by occasionally sunshine. I’m still hoping to see a partial eclipse. My eclipse glasses are at the ready. Supposedly, 70% of the sun will be covered by the moon where I am. My DVR will be recording the coverage of the eclipse on television. While I’m outdoors I will probably be listening to NPR, though radio coverage of an eclipse does seem lame. A solar eclipse is a truly miraculous event. One could never happen were the sun and moon not the relative sizes they are and the distance they are from one another. No other planet in our solar system—perhaps no other planet in the universe—experiences what many Americans will see today. On the other hand, I do not consider it a miracle that a solar eclipse will be seen across the United States on August 21, 2017. Religion News Service has reported on what various religious people have said about the eclipse, much of which is simply stupid. 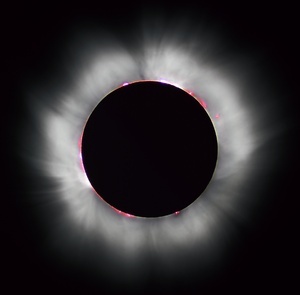 Anne Graham Lotz—I had thought she was the reasonable offspring of Billy Graham—sees the eclipse as some kind of warning to America about its sinful ways. Well, maybe. But that interpretation suggests more belief in predestination than I suspect Ms. Lotz consciously accepts. Since eclipses can be predicted centuries ahead, God must have known—or ordained—that the United States would need a warning in the twenty-first century. I guess we’re all living the lives God has planned for us, only imagining that we have any control over them. This may, in fact, be true, but it is an idea that really isn’t very useful. Well, it’s nearly time to turn on the TV. I hope the sky is clear where you are. I’m hoping the same for Indiana, Pennsylvania. Update, 3:15: The clouds were largely co-operative. Until maximum coverage was achieved, clouds only occasionally covered the sum. Now, however, one can only see clouds. What is amazing is that, even when 80% of the sun is covered by the moon, out star still shines brightly. I’m grateful for seeing as much as I did.